The Australian Kangaroo gold bullion coin series was first issued in 1987 and is currently produced in 1 oz, 0.5 oz, 0.25 oz, and 0.1 oz sizes, as well as a very large 1 kg gold coin. Each year, the kangaroo imagery on the Kangaroo Gold Bullion series of coins changes, which explains its popularity with both collectors and gold investors alike. 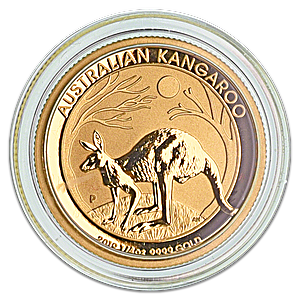 The 1/4 oz Gold Kangaroo bullion coin is produced in an unlimited mintage. For 2019, the obverse of the 1/4 oz gold Kangaroo features a kangaroo standing on a mound of grass with a sun and stylised trees as a backdrop. The imagery is inscribed at the top by the words 'AUSTRALIAN KANGAROO', and includes a ‘P’ mint mark signifying Perth. The obverse also displays the coin's year '2019', weight '1/4 oz', and the coin's purity '9999 GOLD' .